Early holiday shopping?Â Have some unused cash on your Paypal account?Â Can’t make day 2 in a WSOP $1K, let alone run deep in the Main?Â eBay has you covered. Listing the item under the “Jewelry & Watches >> Fashion Jewelry >> Bracelets >> Other” category, Peter Eastgate, who announced his retirement from poker during the series in July, put his 2008 World Series of Poker Main Event Bracelet for auction on eBay yesterday – donating 100% of the sale amount to UNICEF. PartyPoker’s Tony G, who has pledged to win the bidding for the “pre-owned” item (a.k.a. 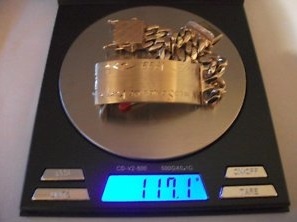 bling for his German Shephard Zasko), can be assured that there is no wear and tear:Â The Las Vegas Review Journal quotes Eastgate as saying that while he had great pride in the title, the bracelet was never worn. While this sale hasn’t been met with a lot of support by poker media-types in Twitter this morning, at least the potential buyer(s) will be happy to know that it is ready for delivery (standard shipping free!) just after Dec 24th.Â No returns accepted. The Ryan Seacrest of Poker? 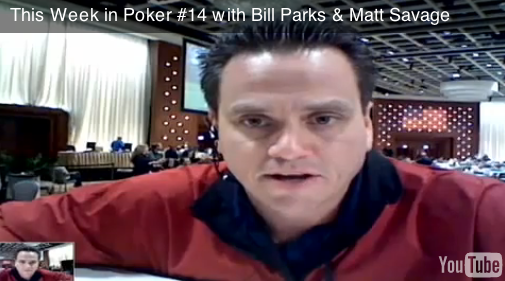 Matt Savage joined us on This Week In Poker live from the WPT Borgata last Tuesday. We never ever pick favorites. Never. Ever. With that said, our interview withÂ Matt Savage last Tuesday onÂ This Week In Poker was our favorite so far. Lots of solid topics covered, and great questions submitted from our viewers, including one from Jay â€œWhoJediâ€ NewnumÂ on whether WSOP bracelets should be awarded outside of Vegas. The final table starts at 2pm London time, (6am Vegas time) with updates available at PokerNews and WSOP.com. At 5pm Thursday, the second WSOPE bracelet event gets underway, Â£5,000 + Â£250 Pot-Limit Omaha event, won last year by Jani Vilmunen, who bested a field of 154 players to earn over Â£200,000. UPDATE: Hellmuth finished in 7th place for $30,000. The $1,500 No-Limit Holdem has about 100 players remaining when they resume from dinner break. Mike Sowers leads the field with 632,000 in chips, follow the action and updates at PokerNews. The $10,000 HORSE World Championship has about 75 players remaining as they try to reach the money when 24 remain. The current chip leader is Steve Bilirakis (205,000) followed by Greg Raymer (170,000), Annie Duke (167,000), Robert Mizrachi (145,000) and Matt Glantz (105,000). More updates and chip counts at wsop.com. Six levels of play have taken place in the $2,500 Mixed Holdem, with 169 of the 507 players who started remaining as they take their dinner break. John Phan is the early leader with 55,000 in chips, followed by Dwyte Pilgrim (46,000), Andy Bloch (36,000), Brandon Cantu (25,000) and Justin Bonomo (20,200). More details to come at wsop.com. Follow all the final table action over at PokerNews. Day 2 of 10k Stud W.C.
Less than 50 remain in the $10,000 Seven Card Stud World Championship with Ray Dehkharghani the current chip leader at 275,000. 2009 November Niner Eric Buchman holds down 2nd place with 270,000, while 50k Players’ Championship runner up Vladimir Schmelev is in 3rd with 230,000. Other notables: 50k Players’ Championship winner Michael Mizrachi (165,000), Men Nguyen (155,000), and Brandon Adams (120,000). Six more levels of play awaits the field or the final table of eight, whichever comes first. You can follow the progress of this event over at wsop.com. The $1,500 Pot-Limit Holdem event burst its bubble early on day 2, with the field now down to just 25 players. James “Flushy” Dempsey is the current chip leader at 290,000. Other notables: Joe Serock (140,000), JJ Liu (100,000), Melissa Hayden (95,000), and Christian Harder (75,000). Play will end when the final table of nine is established or at the end of ten levels of play. 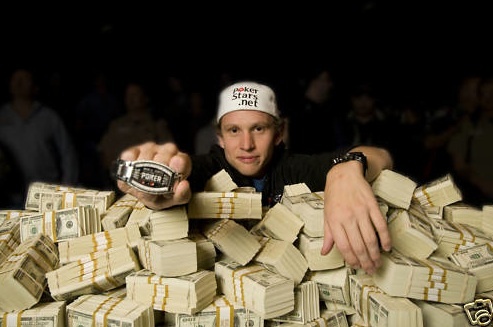 Team Pokerati’s Tom Schneider earned $3,352 for his 52nd place finish, his second cash (in three tries) at the WSOP. A field of 2,563 started at noon in the third $1,500 No-Limit Holdem bracelet event. Less than 800 remain in action at the moment, with Tom Dwan the unofficial chip leader with 56,000. Other notables with healthy stacks include Blair Hinkle (43,000), Shaun Deeb (36,000), Annette Obrestad (25,000), and Liv Boeree (23,000). Less than four levels of play remain for day 1, with the top 270 players cashing, with the winner taking down an impressive $614,248. For the Team Pokerati fanbase, Pat Poels was the lone entry for this event. A field of 625 took to the felt for the $1,500 Limit Holdem event, and around 550 remain as the field takes their dinner break shortly. The duo of Vanessa Rousso and Chad Brown are the unofficial top two with Rousso (10,800) holding a slight lead over brown (10,100). For the online poker community, Jimmy “Gobboboy” Fricke is third with 8,500 and other notables such as Jeff Madsen (6,250), Team Pokerati’s Tom Schneider (5,600), and Chris Ferguson (5,400). Team Pokerati also has Julie Schneider, Danny Noam, Robert Goldfarb entered in this event. The top 63 players make the money, with first place $189,870 along with a coveted bracelet, follow wsop.com for further updates and chip counts. Recapping the Thursday night action as we start week two of the WSOP with a pair of bracelet events starting this afternoon. Day 3 of the $1,500 No-Limit Holdem event has 25 players remaining when play resumes at 2:30pm this afternoon. The current chip leader is Saar Wilf with 1,207,000 followed by 2009 Casino Employees winner Andrew Cohen with 1,025,000. But the name that most will be following today is Phil Hellmuth, 5th with 567,000 in chips, going for his 12th WSOP bracelet. If he made the final table, would a decision be made to stop and hold the final table on Saturday in front of ESPN cameras? Hungarian Peter Gelenscer bested Raphael Zimmerman in heads-up play to take down the $2,500 2-7 Triple Draw Lowball bracelet along with $180,730. Zimmerman pockets $111,686 for the runner-up finish, while Don McNamara finished third for $73,803. Full results and Nolan Dalla’s tournament report can be found at wsop.com. After much discussion, tournament directors decided to halt play with 65 players remaining, two players short of the money in the $1,500 Pot-Limit holdem event. James Dempsey ended the day as the leader with 205,900 in chips. Original November Niner Scott Montgomery is in 2nd with 193,300. Notables in contention: JJ Liu (123,900), Joe Serock (70,400), Melissa Hayden (64,800), and Christian Harder (45,200). Team Pokerati’s Tom Schneider is also hanging around with 20,100 in chips. The full list of chip counts is available over at wsop.com. The $10,000 Seven Card Stud World Championship concluded play after eight levels with the top two finishers in the $50,000 Players’ Championship, Michael Mizrachi (191,900) and Vladimir Schmelev (180,000) 1st and 2nd in chips with 85 players remaining. Plenty of notables are remaining, the full list is at wsop.com. Just 16 will make the money when play resumes at 3:00 this afternoon. The third $1,500 No-Limit Holdem event of the WSOP gets underway at 12 noon today with another 2000+ player field expected. For comparison purposes, Mike Eise is the defending champion of this event, besting a field of 2,638 for $639,331. At 5pm is the $1,500 Limit Holdem event, won last year by Tomas Alenius in a field of 643.